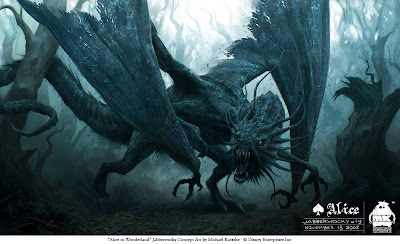 Final design of the Jabberwocky for Tim Burton's "Alice in Wonderland". I was imagining him a little less shiny than he ended up in the film. great design and killer execution. adding your blog to my blog roll now that you have one! thanks for stopping by and leaving some feedback! Amazing design and lovely mood! have you studied arts? I am studying arts in spain. Thank you! I've never studied arts, I'm self taught. @crokis design: Thanks, I'm using Corel Painter for the most of the time. Looks like a lot of the work ended up "shinier" in the film. Your concepts have so much more personality. Love it. Stunning work on this blog! I'm definitely inspired! This is really unique work. I visited your site a couple days ago and I had to come back. You really add an new dimension on reality, a crunchy authenticity which stays in the mind. Do you sell any artwork? I am very interested. Caroline: Thanks for that! I have an online shop for high quality art prints in development. Once it's launched I'll post an update here. Very nice creature design and definitely scarier than the CG version in the movie. Wonderful work as always Michael! Thanks for being an inspiration and my first "heavy hitter" on my CGSociety network. Came here from CGTalk, then google, then DeviantArt... just read your story, which brings hope to all self taught artist out there (a.k.a. ME!, even when I'm not half as skilled as you, like Mulder, I want to believe!). I'll be honest, been googling around because I'm dead curious about something: how old are you? Come, bring it on! I'm ready to take frustration! Woaaw! is this done with corel painter? hmm I wish I can do art like that with my corel....awesome.really nice detail,,really matches the background! Michael Kutsche is an award-winning German artist based in Los Angeles, California. He is a self taught artist who works both in traditional and digital media. His work is best described as an astoundingly lifelike depiction of parallel realities, populated by odd characters reminiscent of movies, comics but also Flemish Renaissance Painting. His unique approach of imaginative character creation has led him to become a character designer on Tim Burton’s “Alice in Wonderland”, “John Carter of Mars”, directed by Andrew Stanton and "Thor", directed by Kenneth Branagh. Parallel to his career in the film industry he still keeps track of his own projects, including paintings for future exhibitions, book projects etc.